Classics Corner is a feature in which I highlight those classics that I am reading and offer my views and comments in the hopes that you will be inspired to read some of them in addition to all the great YA reads out there! 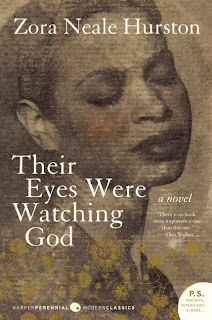 Up now is Zora Neale Hurston's novel, Their Eyes Were Watching God. I thought that this book was interesting in that I haven't really read anything similar to it. When I first started it, I got quite excited because I recognized a sizable chunk of the first chapter from some standardized test I've had to take at one point or another, and it was neat to connect the excerpt with the rest of the story. The basic gist of the novel: Janie, a fairly well-off woman who lives in Florida, granddaughter of a freed slave, has returned to her home after a long absence, and when asked by her closest friend where she has been and what happened to her husband, she begins to tell her life story, starting at her childhood growing up with her grandmother. The story is quite fascinating. Janie is independent and smart, but her grandmother's fear that her willfulness will clash with white prejudice propels her to force Janie into a loveless marriage for her safety and protection. (The irony is, Janie's grandmother's actions, rather than free her from such dangers, actually keep her imprisoned for many years.) Janie runs away from her first husband to a young man named Jody, who talks of a town where black folk are leaders and run everything. Though Jody seems perfect at first, the years reveal his controlling ways, and Janie is, once again, imprisoned within an empty relationship. But after Jody dies, Janie meets Teacake, who is years younger than her, but soon becomes her third husband. She leaves town to go with him, much to the horror and derision of her neighbors. For me, the book really picked up when Janie met Teacake, and for the first time in her life, found freedom and happiness. Though there were many aspects of their relationship that I disliked (Teacake would slap Janie around, just because it was expected of him and because he was jealous), the book was a very interesting representation of how different that culture is from mine, and I did learn a lot. There is also a quote in the final chapter of the book that did help me make sense of the more inscrutable workings of their relationship, and it is (roughly paraphrased), " Love is like the sea. It's a moving thing, but still and all, it takes its shape from the shores it meets, and it's different with every shore." That quote really made me think again about Janie's entire story. Now, my copy had less than 200 pages, so this is a short book, but what really tripped me up about it is that Hurston writes much of the dialogue in the dialect--that is, it is spelled the way it sounds. So, "I" becomes "Ah", "like" is "lak", and "my" is "mah". Sometimes it was like translating a different language just to read the conversations, so that got quite frustrating after a while, and it slowed me down considerably. But other than that, this really was quite a fascinating book, and every time I think of it, my mind wanders back to that quote. I am very curious about the movie that Oprah produced, where Janie is played by Halle Berry. I must see that now! I read this book for my English class a couple months ago, and I really enjoyed it. The way the dialogue was written was one of my favorite parts. I could kind of hear it in my head. I'm definitely planning on looking into getting a copy of the movie. The only thing I didn't like, was that in my copy of the book the introduction someone had written basically spelled out the entire plot. I hate it when they do that. I read this book for a college English class and I really enjoyed it. Janie is such a distinct character. However, like you, the dialect tripped me up and slowed me down. I understand that it's used for authenticity's sake but it hindered my storytelling experience too. It's the same in the Harry Potter series for me, I can't stand reading Hagrid's parts because JKR uses his own dialect. I read (and reviewed) this in October for my AP Lit class. I thought the story was interesting, but I could not read the dialect! I think it's just because I've never really been exposed to it before, but it made Their Eyes Were Watching God hard to read. Btw, I love that quote! This one is on my shelf and I still need to read it. I loved this book! The dialect was hard for me to get through at first, but I appreciated the authenticity and found that reading the dialect parts out loud really helped my understanding. Also, loved Tea Cake as well. Didn't Tea Cake's fate just break your heart? OMG. This is one of my faves, too, and you're reminding me that I need to reread it. I really liked this book too and I want to see the movie! the dialogue could be confusing but it made the book very authentic and true to how people would have talked then. Hi, my name is Maria and I live in Portugal. I really need your help. I bought through Amazon "Their Eyes Were Watching God", cause I need it for my English Degree. Unfortunately, I found out that page 192 and 193 are missing. My book ends with "... and it's different with every shore". But I know it goes on. Can any of you scan just this 2 last pages, ou type them down for me? I've already contacted Amazon, and they are sending me a new book, but it won't get here in time for my presentation, since I need it until next Tuesday. I've been working on this book for nearly 6 months, and know all my work is going down the drain just because of 2 pages. I'm going to have to repeat all the semester, 'cause of an 2 blank pages in a book. I've searched all over the net, but I can't find these 2 last pages, only parts. Please help me. My e-mail address is mariathomas0306@gmail.com. I really don't know what to do. I haven't read the book yet but based from what I heard about it, I think it's great.